Hi, I'm running a special on my Fine Art America page. This image of the grain elevator at Meadows, Manitoba at sunset is on sale. This is a stretched canvas print, ready to hang with all mounting hardware included. You can also have a look at the other prints I have for sale there. Thanks! The first trains I saw in 2013 were on January 1, in the morning. I was returning from taking someone to the airport and stopped at the CN Rivers subdivision to see if anything was coming. I went out to Diamond, and the west-facing lights were lit. TRAIN! I went out to the curve west of Diamond and it was not long before headlights were visible to the west. They turned out to be on CN 8920 leading an eastbound intermodal (with IC 2699 and CN 2242). I took a few shots on the curve and then hit the road. Fortunately they had a LIMITED TO CLEAR signal to cross over to the north track, so that slowed them enough for me to get ahead of them after Diamond. I took a few shots from the side and then leap-frogged them again. Note the heavy frost on these engines, on the nose and on the louvres. Once more I got ahead of them and saw they were meeting a westbound. I tried to gauge the meet as best I could and hopped out to get the shot. The westbound was another intermodal train, with CN 2336, CN 2537 and pusher CN 8811 on the rear. I processed this in black and white to show the frost. I sped ahead of the westbound to get this shot right at mile 7. Nice wave from the conductor! Again I was able to get ahead of the train, just before Diamond. Much to my surprise I saw an eastbound freight west of Diamond. I "shot the meet". The intermodal had CN 8811 on the rear. Check out what is written in the grime between the engine numbers on 8811. The eastbound freight sat there west of Diamond for quite a while, waiting for their light. I think it might have been CN 198 but I don't know for sure. The second unit was BCOL 4641 (in CN colours). After maybe half an hour they started up and crossed over to the north track. I gave chase as usual. I got the next shot under the transmission line towers. I had been meaning to get a train here, and since I had shot CN 2291 a couple of times already I figured I could "waste" a shot to frame this up. Right after that I was again surprised by another meet. A westbound intermodal met them near the Perimeter. The westbound was probably CN 101 and had CN 2296 on the head end, CN 8876 in the middle and IC 2709 pushing on the rear. I grabbed a quick shot of CN 2296 but I was able to get a better shot of the middle unit CN 8876 near mile 10. Finally, here's IC 2709 heading west (left) and CN 2291 heading east (right). 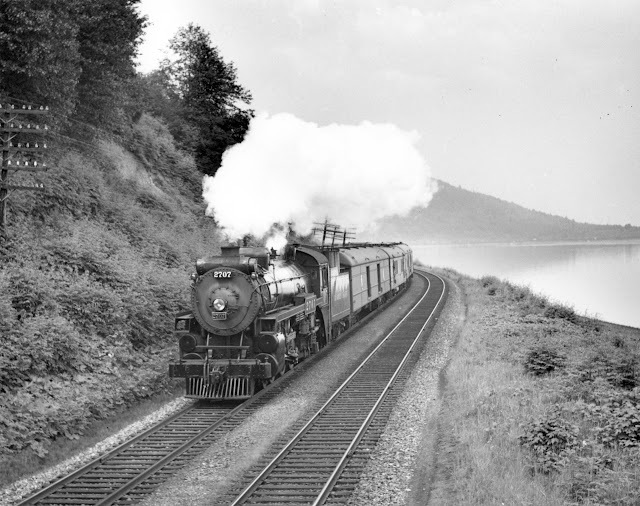 Check out this treasure trove of train photos from 1942-1959, taken by Andy Morin and apparently posted by Pierre Morin. Amazing stuff. It appears to be all Western photos (Alberta and British Columbia) but there are some great passenger and freight trains shown. I saw a fair number of trains on Thursday, January 17... seven, I think. It started in the morning when I was driving to work. A local CN train was working the cement plant off route 90, in what is known as Fort Whyte. Remanufactured GP9 CN 7254 and slug CN 200 were paired up and working via remote control. I ended up standing on a snowbank to shoot over the fence for this shot. Note how the sun was just barely high enough to light them up! EDIT: I was wondering what the "T" on the side of CN 7254 was for. Gord Hilderman of cnrphotos.com kindly told me that "The T stands for Trimmer locomotive, shims are placed between the top of the trucks and the bolster so the pilots and fuel tank don't hit and get caught up in the group retarders at the hump." He went on to point out that there can be an "H" instead like CN 7211 (photo, blog post). Thanks, Gord! At noon, I went out to try to catch the Canadian. 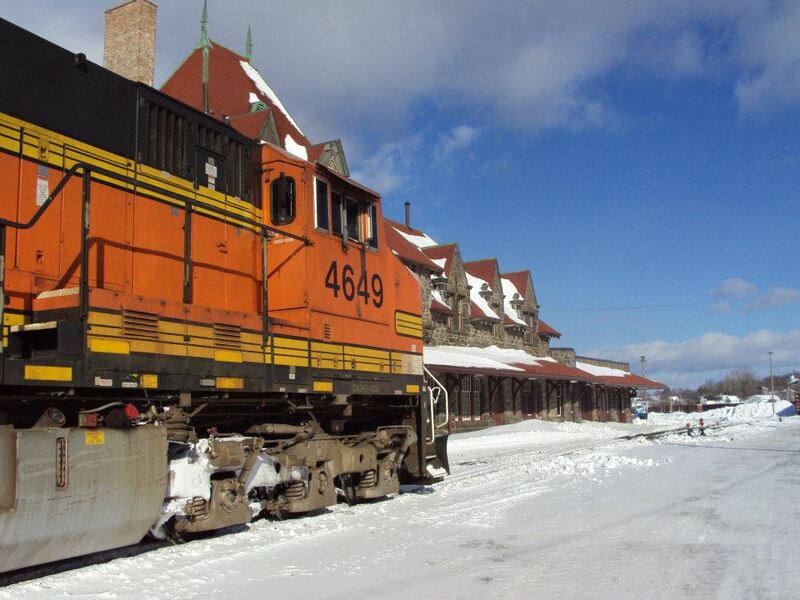 Since it doesn't run on Saturdays during the winter any more, Monday or Thursday are the only days to catch VIA 1. I went down to St. James Junction to wait for them. Soon enough a headlight showed to the east, but it was CN 101, not VIA, coming at me. I stood on another handy mound of snow to shoot CN 2257 leading the train. That was the sole engine on the head end, and there was no more power until CN 8963 brought up the rear. Right after that, a CP local came rolling north on the La Riviere subdivision. The light is always wrong for a northbound here, but I did the best I could. It didn't seem like VIA was coming, so I headed out, but not before catching a glimpse of the CEMR train heading to Carman Junction. It had CEMR 4001 leading and CEMR 5396 trailing. On my way home from work, I caught a glimpse of a CP local heading south on the La Riviere subdivision at route 90. It had CP 1590 and CP 8205 leading some tank cars for the gas facility near the Perimeter. A few minutes later, I spied CN 2549 East rolling along the Rivers subdivision, so I picked a spot to stop and I snapped this photo. It had a lot of potash cars on the head end, but the rear was mixed freight. The second engine was CN 2106 and the third was BCOL 4644. I heard that VIA 1 was coming... very exciting! I headed down to Carman Junction to wait for it. In the past few days a CN maintenance gang has been replacing rail on the south track around miles 8-10 and they were just heading to the stub track just west of the Perimeter Highway. It was interesting to hear the hotbox go off over and over. "CN detector. Rivers sub. South track. No alarms. Speed. 8 miles per hour. Temperature. Minus 19 Celsius." Soon enough the Canadian's headlights were visible in the distance. They approached, and in a flash they were past on the north track and heading out of town. It's getting down to the winter consist! I didn't hear why it was delayed, but I suppose it was held up in Ontario due to the blockades that were held on Wednesday. There has been an update on the mysterious silos that appeared in BNSF Manitoba's yard. Fort's lawyer, former councilor Gord Steeves (he was my councilor and my kids' soccer coach, actually), says they will probably appeal. To whom, I am not sure. It seems likely this will go to court. I drove by the site on January 16th and I see there is a small building at the base of the tanks now. Check out these amazing aerial photos of Nova Scotia from 1931. The Nova Scotia Archives holds the Richard McCully Aerial Photograph Collection. These photographs were mostly taken by Harold Reid, owner of Reid's Picture and Equipment Ltd., and the plane was flown by Marty Fraser, an ex-RCMP officer and military pilot. The photographs are fantastic - the detail is incredible for 1931! The best part about this display is that you can zoom into the photographs to see details. The Archives acquired the 221 glass negatives in the spring of 2012. The negatives were printed and scanned and they look fantastic. Here's the Truro yard and roundhouse. I can see 4 steam engines, various rolling stock (mostly boxcars), and quite a collection of passenger equipment in the yard. Here's the Halifax grain elevators area. Lots of outside-braced boxcars are visible. Just to the left of the centre of the photograph are an old passenger car and an outside-braced wooden caboose! In this photo of the Yarmouth Cotton Mills you can see a yard with some passenger cars, and just to the right is a roundhouse. 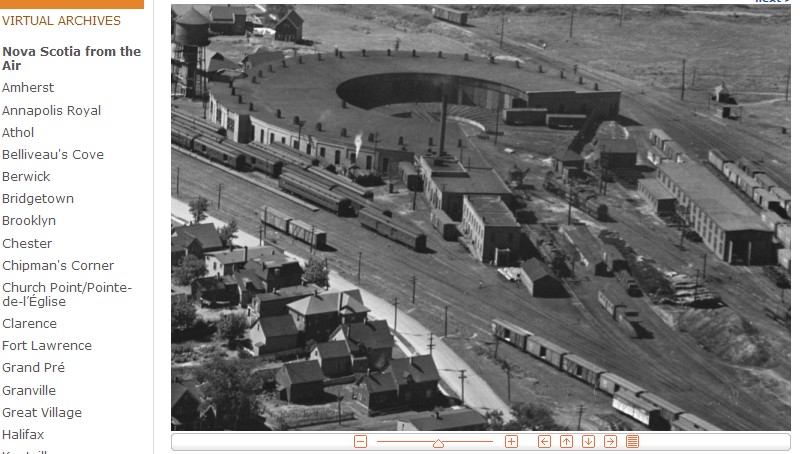 There are some nice photos of Amherst, including this one of the Enamel Heating Plant with the train station in the background. The Irving Oil refinery in Saint John, New Brunswick has been receiving oil trains from North Dakota and the surrounding area. These have generally been coming over NB Southern's tracks as 80-car unit trains, although some oil cars have trickled in on CN via CN 406. 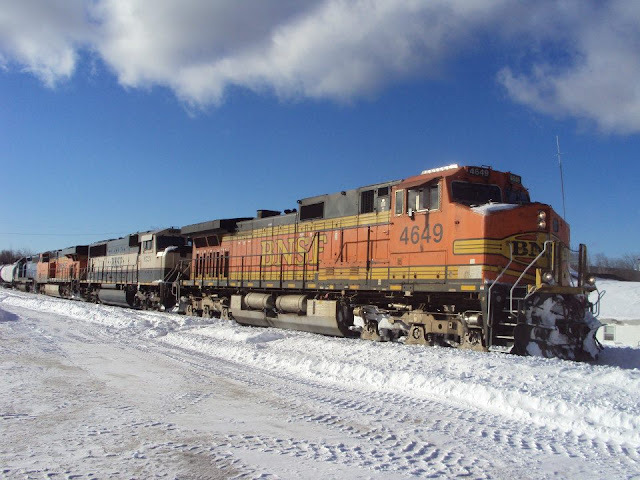 Railfans were excited to hear that a unit oil train was coming with three BNSF engines on it. 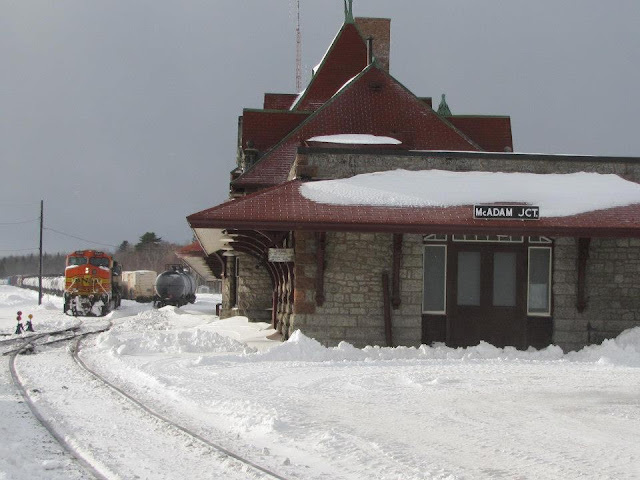 The train arrived at Hermon, Maine on December 29 with the BNSF engines, and ended up parked on MM&A rails for a few days, apparently waiting for a crew. The train finally made it to McAdam this past Saturday (January 5) at 10:30. Jody Robinson reported that it dropped its train in track 28 and made up another train with the oil cars already in McAdam, then hit the road around 16:15. It was reported through Harvey at 17:00. Jody Robinson and Gary Bowser did great work documenting the train in McAdam. The train had BNSF 4649 (Dash 9-44CW), BNSF 9723 (SD70AC), BNSF 7589 (Dash 9-44CW) and HLCX 6332 (SD40-2) for power. Here are a couple of Jody's photos. 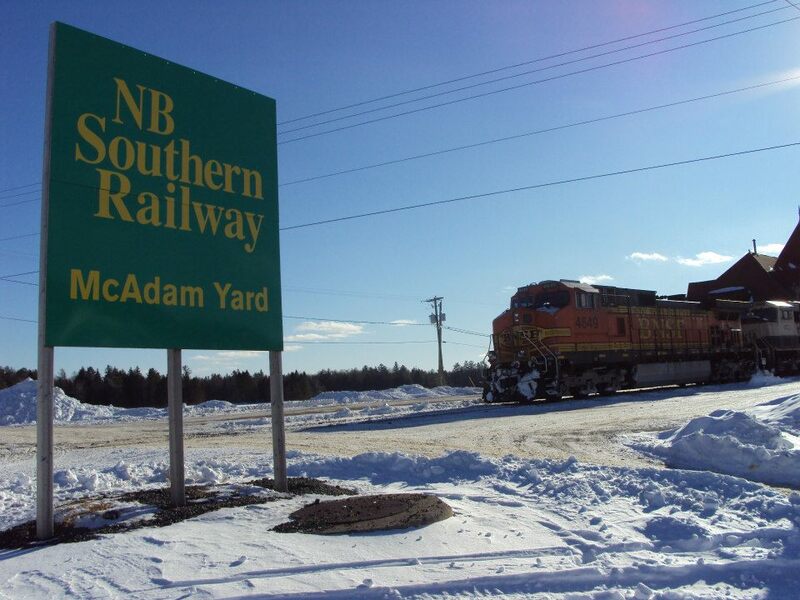 I think I can safely say that these are the first BNSF engines to ever visit McAdam... given that BNSF did not exist prior to NB Southern's existence. Here are a few of Gary's photos, as well as a video he took. 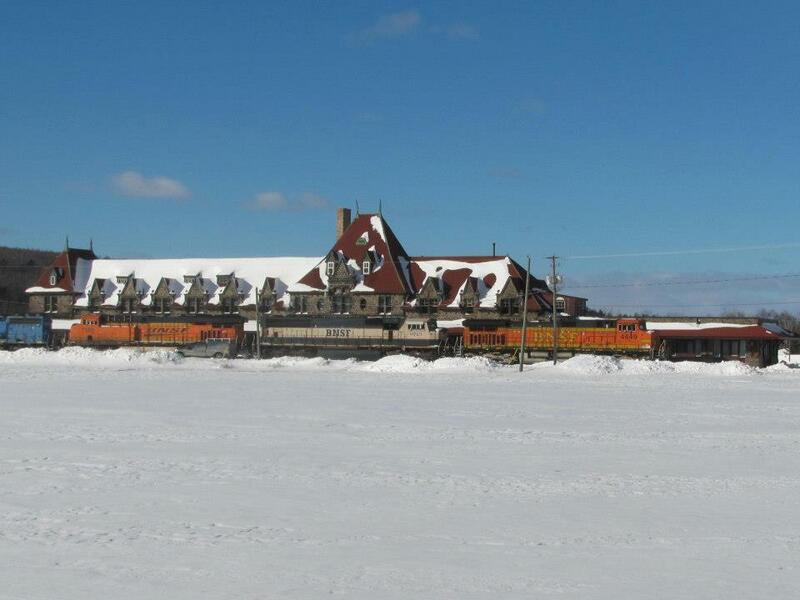 Matt (aka Saintjohnrailfan) caught the train rolling through Grand Bay on its way into Saint John. The power did not stay long in Saint John. It went west on Sunday the 6th with empty oil cars and some miscellaneous freight. This time both Matt and Dave Dineen (aka nbsrfan) caught the train. Here's Matt's video first. Great work, Jody, Gary, Matt and Dave! Special thanks to Jody for keeping the Facebook RailsNB group updated on the train's progress.